Crystal has enjoyed learning some more French this week. We have been learning how to say the weather. She found she could do it and found it funny. She also enjoyed starting to learn about Netball and the new game we learnt and played called Golden child. Ask them how to play it. Peace has enjoyed the science we started this week - Our changing world which concentrates on plants and trees. She enjoyed studying leaves and drawing them. Millie enjoyed learning about leaves as well and going out to collect them. She preferred the smooth edged leaves. Charlotte has enjoyed the maths topics this week of dividing and multiplying. She has found that she has been confident completing the maths and has enjoyed being tested by the challenges. Adeena also loved the maths this week. She enjoyed the hard challenges that really tested her. 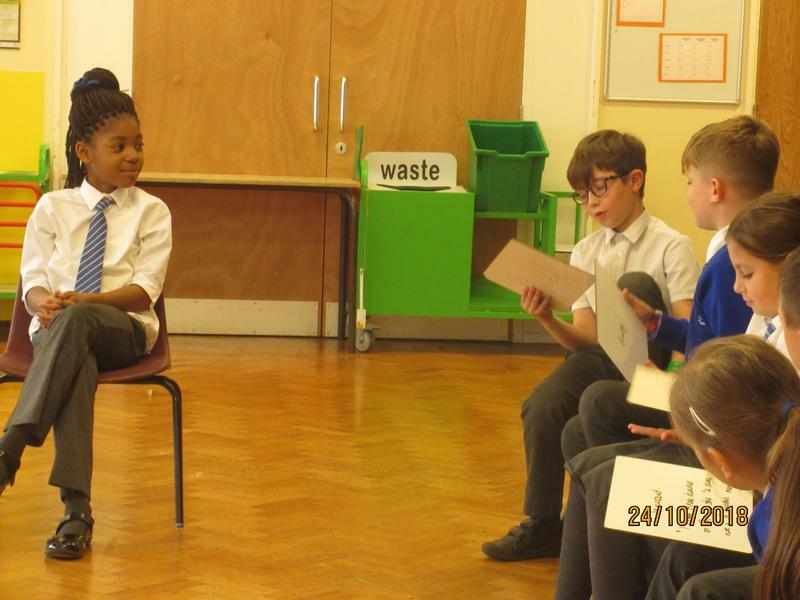 Hornbeam took part in some drama related to their History Topic. They re-enacted The Trial of Anne Boleyn. Peace was the unfortunate Anne Boleyn and some very good arguments were put forward from both sides of the court. This was a lovely activity to complete the History topic for this half term. Have a lovely half term. We have been enjoying the good weather this week and we have been trying to do the Daily Mile as often as we can. This is when we go out to the field or the playground and run, walk, skip or dance around a planned route for between 10 and 15 minutes. This increases our fitness and we also get fresh air and a change of environment and we can then come in with fresh eyes and a clearer mind to work in the classroom. We have also been trying to gain our Bronze and Silver Timetables Challenge certificates and we are already awarding quite a few tin his Friday's sharing assembly. Keep practising !! The children have been learning how to say their age in French so don't be surprised if they ask your age ! Just lie as they only really know up to 39 at the moment !! Adele is loving earning her Bronze certificate this week. Isabelle commented that everyone has had to work hard on column subtraction as it hasn't been easy but we are all able to rename our numbers during the process. Millie said that she has been enjoying reading The Lion With and the Wardrobe and writing descriptions of settings. Hello Parents on this Windy, Autumnal Friday. This week the children have been preparing for Harvest Festival at North Mymms Church. Hornbeam were learning about Harvest celebrations in America and they produced Turkey pictures and they wrote about what they were thankful for. The service was lovely and Reception to Year 6 took part. Each class learnt about Harvest celebrations in other countries such as India and Poland and of course England. The children donated tinned or packaged foods which are going to a food bank in Hatfield. 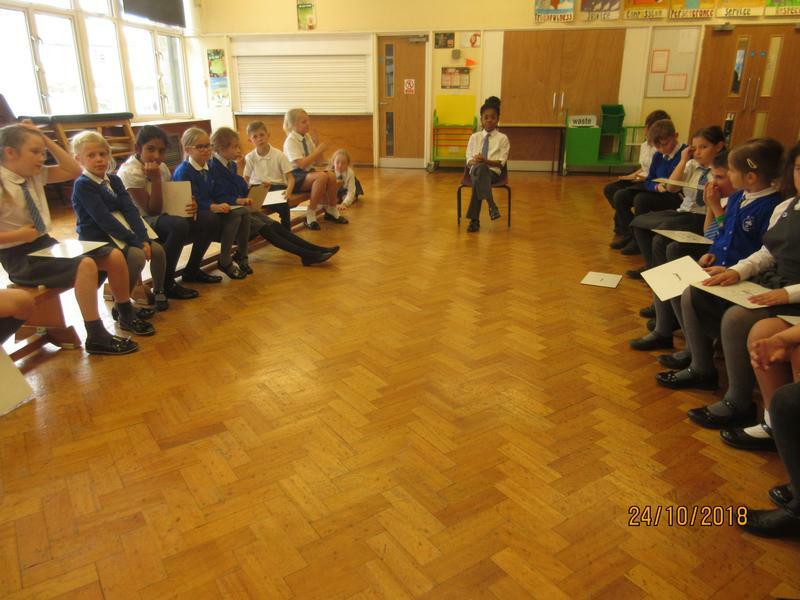 The class prepared their readings and some children read them to the congregation very clearly whilst others acted out the first american celebration with the American Indians. Others showed their Turkey paintings and read out what they are thankful for. 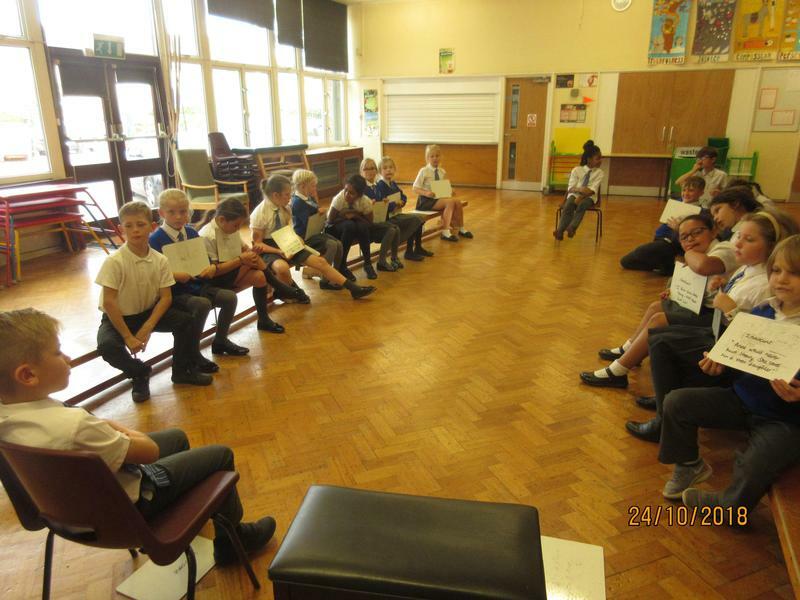 We all sang a variety of Autumn Songs they had been learning in Singing Assembly. This week we have been writing abstract riddles about feelings. Here are a few. See if you can work out what they are. You think of me as baby blue. I am as calm as a waterfall. When you meditate you can feel me. I am hidden inside your heart. When you feel me you would like to watch the sun set. I am like a dark grey mouse. I come with a scream or a shout. Maybe even a sad gloomy face. Children are scared of the darkness. It is ok to feel like me. Everyone has feelings and emotions. I am an adventurous laughter. On an emoji's face I'm found. You'll be like jumping bunnies. Swishing rainbows in the sky. A review of this week from some our children in Hornbeam. Maddison - I like PE as I likes aiming my pass at Millie's Lacrosse stick. We did improve over the lesson. Lea - I loved playing the shark game. Jay - I got better at throwing and catching in Lacrosse. Charlotte - Maths - I have enjoyed learning how to round my numbers up or down and how to estimate. Peace - English - I have been able to show off my writing skills when writing our own riddles. George - French - I have loved counting in French and doing sums in French too. Have a lovely weekend. Until next Friday. This week has been a busy week as usual with lots of fresh information absorbed in Topic, French, PE and Science. The children have been writing their own autobiographies, seeing how solids mix with certain liquids or not as the case maybe, learning to throw and catch a ball with a Lacrosse stick and learning how to say they like or love people and things in French. Nok enjoyed the year 5 and 6 trip to a concert at Hatfield House because she had heard music she hadn't heard before. In science she enjoyed learning new information. Charlotte said she has been enjoying maths as she is liking working with large numbers. Lewis enjoyed the trip as he went on a train and had his own train tickets. Have a good weekend. Until next week. Welcome Parents, we have just completed our first full week. Adeena said it has been a joyful week with both our new teachers. Nok said she enjoyed maths this week it has been both difficult and somewhat easy too. As we would say in French comme ci comme ca (so so). Peace - our new member of the class said that my first full week at St Mary's has been fantastic. I would give it a 5 star review !! Praise indeed. Peace has received a red certificate with Lincoln today, it's also his birthday. Our star of the week is Maddison. Well done for being so ready to learn and answer questions. Mason has enjoyed learning about biographies in English and looking at different biographies like Anne Frank. Crystal is enjoying the class book - Tudor Boy Spy (set in the tudor times). Have a lovely weekend. a la semaine prochaine (until next week). Welcome to our very first blog of the year. It has been a very busy first few days and although we are all finding our feet and learning new arrangements, the children have agreed that they have enjoyed and learnt many things already. Finley said - we enjoyed starting to play Tag Rugby with Mr Willis on Wednesday. George, our first star of the week, said he has learnt how to present his maths book more clearly and to use the squares properly. He likes how it looks. Adeena - we are enjoying the Science topic of Marvellous Mixtures. 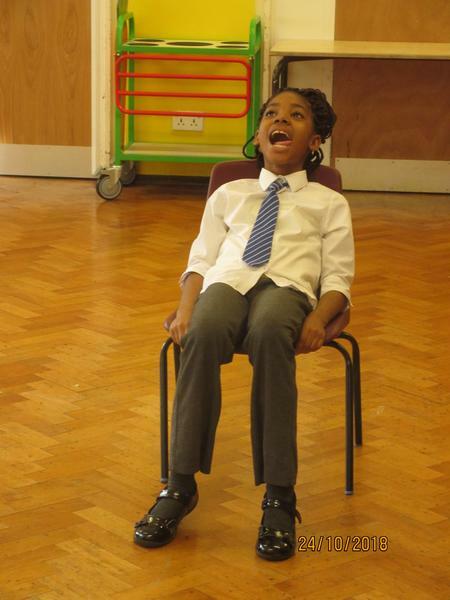 Ivo - I loved maths because it felt easy and I could do it all. The 'Off with her head' Tudors topic has gone down well as the colourful King Henry VIII has interested them, in particular how he got rid of his wives ! Crystal has enjoyed learning and speaking in French and some children I believe said good night to you before they went to bed in french - bon soir! Here's hoping our next full week is as good.